Plans included: Koroni (1:10 000) Limenas Kalamatas (1:12 500) Yithion (1:12 500) Ormos Kapsali (1:5000) Dhiakofti (1:12 500) Monemvasia (Yefira) (1:7500) For this 2014 edition the chart has been fully updated and modernised throughout. 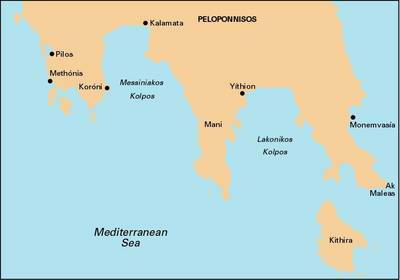 The sketch plan of Koroni has been replaced with a fully WGS-84 compatible plan; the plans of Ormos Navarinou and Ormos Methonis have been removed; and new plans Ormos Kapsali and Dhiakofti have been introduced. Positional accuracy has been checked and improved throughout.